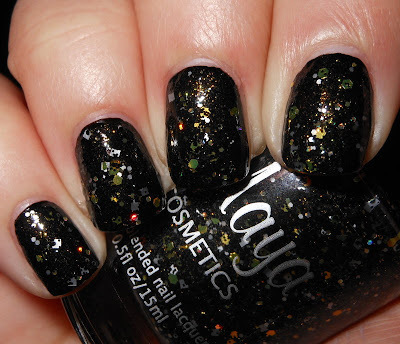 I have some polishes from Maya Cosmetics to share with you today. 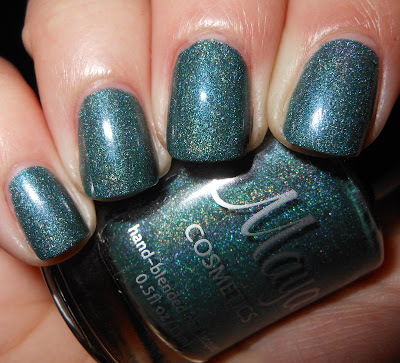 Kat from Maya Cosmetics kindly asked me to review some of polishes, and I happily agreed. When I opened up my package I was welcomed by these beautiful polishes. This is available starting today, November 15th. It will be $9. Nefarious Aquarius is dusty teal scattered holo. Nefarious Aquarius, what a great name. This is a neat color for a scattered holographic polish. It is a beautiful muted teal which is not something I've seen paired with a holo before. The formula on this was amazing! I was really surprised. I'm used to scattered holos being kind of sheer and to have an uneven application. This was not like that at all, it was a 2 coater, smooth, and had even coverage. Redemption and Treme will be part of an upcoming collection in January called the Crescent City Collection. This collection is inspired by New Orleans, a city filled with mixed culture and brass bands. Both of these polishes will be available for preorder starting today, November 15th- November 25th. They will ship on or before December 5th. After the preorder dates, they will not be available to purchase again until January. Hurry up and pick up these two during the preorder. They will make excellent holiday polishes! These will be $8 each. Redemption is a mixture of varying sized black black glitters, white holo hexes, gold holo hexes, white squares, gold hexes, and a prominent golden shimmer in a clear base. This is a polished inspired by the New Orleans Saints. This is meant to be layered. I wanted to show you a swatch of it alone so you could see what I meant. This is gorgeous. This is a beautiful combination of colors and glitters. I love the addition of the shimmer in this polish, it really makes it so special. I like when indie makers add that extra special shimmer into their glitter polishes. I used 2 coats here, but you could easily be satisfied with one. I love sparkle, so 2 coats made it that much better! The formula was easy to work with. I didn't have to fish for glitters which is a plus. Treme is champagne-golden full coverage glitter speckled with purple, blue, green, and red glitters. Treme is inspired by a neighborhood in New Orleans influenced by brass bands. This is a full coverage glitter. You will get opaque coverage 2-3 coats depending on if you use thin coats or thick coats. The formula on this was smooth, and easy to work with it. I did not find it thick or tricky like some other glitter bomb polishes. I love the other colored glitters added to the gold glitter base, they really make this polish pop! You could wear this on its own, but if you want to have some added depth you can layer it. I have one coat layered over black above so yo could see how amazing it is layered too! I really enjoyed these polishes. They are thoughtfully made. The colors are unique and inspired. The formula is top notch. My experience with Maya Cosmetics was a great one, and I'm very impressed! 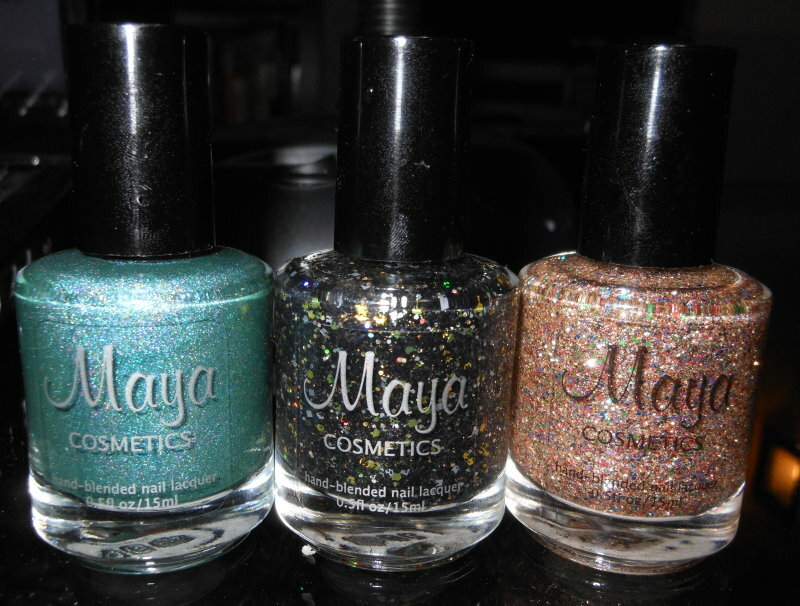 These polishes can be purchased on Maya Cosmetics' website. You can also follow Maya Cosmetics' Facebook and Blog. * I received these polishes to review honestly by Maya Cosmetics. Nefarious Aquarius is gorgeous and is my favourite here! (and I usually don't like blue)! I loooove Aquarius!!! Stunning blue AND holo!!! A New Orleans Saints polish?! I love it!!! And wow, Nefarious Aquarius is just beautiful.